Work decided to complicate the Juggling I mentioned by sending me on a flight to London on Friday evening. I'm almost adjusted to the time change but it won't matter when we are working 20+ hour days until next Friday. This is my first business trip and it is tough that I had no advance notice to plan. My in-laws are flying in on Wednesday to help with the hospital testing for Penny and because Husband has a business trip on Friday he didn't want to cancel. 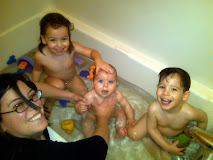 I feel immensely better having them come - and it alleviates a lot of "poor Husband" guilt. Many props to Husband but since this is my blog I wanted to mention some benefits of business trips. Not my problem. It is sad but true - there is not much I can do from here. I feel for Husband that he has to refill Penny's formula prescription, drive to doctor's appointments, etc. but there is nothing I can do about it. Just me. No O2 monitor going off, no noises as a kid stirs over the baby monitor. Just me and my alrarm forcing me out of bed each morning. Only me to shower, dress and feed. Focus on work. I am all about this deal. There is no distraction about needing to be home for bedtime or taking care of them in the morning. A deal is like a newborn since I can only eat and sleep in snatches here and there but it is nice to re-focus on work (hopeful that this travel/work all the time is a temporary situation). No commute. I actually have to take a taxi from my hotel to our office but it isn't that long a commute (few miles). I'm trying to use the time to focus clearly on my work and hope that the kids don't change too much in my absence. Whether this is a life I can lead from here on out is another question for another blog post. Treat yourself to some Cadbury chocolate, as it's made in Cadbury England (just south of Birmingham, if I remember correctly). It is so soothing. Treat yourself to some Cadbury chocolate...so better there, as it's made in Cadbury, England. I know that I always feel guitly about leaving on a business trip, mostly because I feel like I should feel guilty but I secretly enjoy it for all the reasons you listed. Interestingly I doubt any husband/father feels any level of guilt when they are gone. The worst part for your husband is that you were away over the weekend. He was it for childcare!